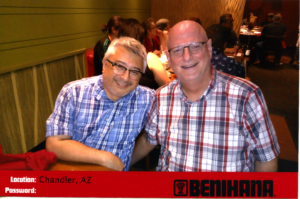 Several weeks ago now, Ben and Keith or as we are more commonly referred to here, as The Two Gay Geeks celebrated their 22nd Anniversary (as someone has remarked, “That’s forever in Gay years”) and got an early start of it at a popular celebrating place called Benihana. In the time that we spent waiting for a table and having our meal, there must have been at least ten birthday songs sung including one at our table. 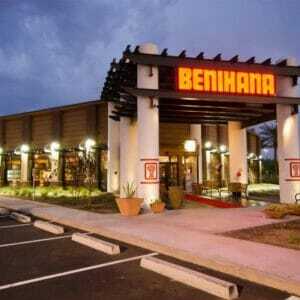 Benihana only has two restaurants in the Surface errr Valley of the Sun, one in Chandler and the other in Scottsdale. Both almost equally as far as the other, roughly 16 miles form our home. So, it is one of those places you have to choose to go. And choose we did, it was one of those let’s be foolish and have a little fun with dinner. We have eaten at Benihana before in California for special occasions with friends so, we knew what we were about to experience. 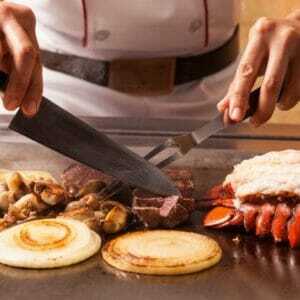 If you have never been to Benihana, it is quite the production they put on. We arrived to quite a number of people waiting for tables but did not have to wait long as they seat guests in parties of 6 -8 around a flat grill with a foot wide bar around the grill for dishes, drinks, and flatware. The waitress arrived almost immediately to take our drink order. We ordered Iced Tea (as usual) and then later ordered two of their signature Red Plum Sake Sangria’s. We ordered an appetizer of the Shrimp Crunchy Roll, which is Tempura Shrimp, Avocado, Cucumber, and crab in a sticky rice roll served with soy, ginger, and wasabi (that wasn’t too spicy at all). I had forgotten how big the rolls are….. The waitress also had taken our orders so the “chef” would know what to bring out. As we were enjoying our Shrimp Roll and beverage the Teppanyaki Chef rolled out his cart with fanfare, of course. First up is verifying what everyone ordered and then the show starts. And show it is, he starts banging utensils around the grill and performs some tricks with each. Oil is applied to the grill to season it. Then the rice goes on the grill in a heap and flattened out and butter added. Then comes the eggs, of course, the spinning of the egg and the egg roll joke is fired to groans and laughs. It is all in good fun. The various vegetables and meats are added to the grill while the rice is still becoming fried rice. The best part for me when going to places like these is the skill that they have with their knife. Occasionally you will get someone not quite on their game but, our guy was a master with his, whisking off the tails of the shrimp and fileting them in one smooth motion. And then there is the obligatory flipping the shrimp tails into the hat routine. As all of this is going on we are treated to Benihana’s signature onion soup, which is more like chicken broth with a few scallions. Benihana salad is next and then the vegetables and meats as cooked arrive on your plate as they are ready. It is a fun experience for a group of people celebrating special occasions. The food is good, the price is reasonable, and the fun is wonderful. We had two other couples at our table. One had a birthday and of course there was us with our anniversary. There was a gathering of employees who arrived to sing Happy Birthday and wish us a Happy Anniversary while we ate our sherbet. As we are waiting for the check and to pay, they bring out a photo in a cardboard frame to commemorate your night. I usually tip generously in the hope that the waitress and chef split the tips. (maybe I am Pollyana,, but one can hope).